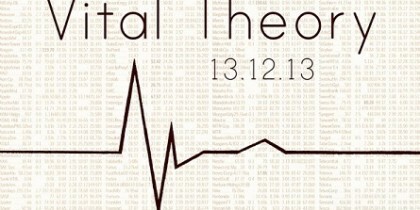 We are pleased to announce the third annual Vital Theory symposium will take place on Friday the 13th of December 2013 at the University of Nottingham. Vital Theory is an academic symposium organised by postgraduate students at the University of Nottingham’s Centre for Critical Theory. The first of these took place in 2011, and it has since grown into a mainstay of the Centre’s activities. We aim to provide both staff and students at the University with an informal platform to present their work and engage with contemporary questions in Critical Theory and Cultural Studies. We explore the potential for critical praxis both on and off the campus. This year the symposium will be oriented around the theme, ‘Technologies of Capitalism’. The question of technology and its relationship capitalism is an increasingly important one, which encompasses a broad range of issues. The symposium will consider technology in its familiar context, centering upon questions of technological innovations in the means of production, the digital economy, and the use of technology for the benefit of the market. It will also explore the term “technology” more broadly, enabling us to discuss late capital’s utilisation of a wide range of social, cultural, and political phenomena. Finally, technologies of capitalism allows us to consider the possibility of technologies of resistance: can new digital technologies provide us with new means of resistance to the hegemony of capitalism? The symposium is a free event, and will offer participants the opportunity to critically engage with these questions through its usual mix of papers and workshops, as well as to enjoy the regular “Anti-market” and Theory Secret Santa. Vital Theory will take place in The Hemsley, beginning with registration at 9:00 am, and will finish in the Bar with the Theory Secret Santa at roughly 5pm. Lunch and refreshments will be provided. If you would like to attend then all you need to do is register by emailing Stefanie Petschick (ajxsp2@nottingham.ac.uk), this will enable us to provide enough food and coffee for everyone! We’re really looking forward to seeing you all there.